“I’ll be back” is a sentence we have all grown to love over the years, thanks to the legend himself Mr Arnold Schwarzenegger! Now thanks to Microgaming you can go back and relive the mission to protect Sarah and John Connor with Terminator 2. Enjoy video clips, movie sounds and some excellent graphics, which bring the thrill of the big screen to the little screen in the palm of your hand! 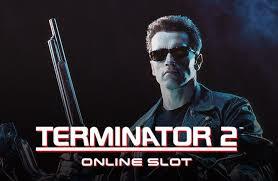 Terminator 2 is a 5-reel, 243 ways to win slot that offers a great RTP of 96.62% to all cyborgs willing to play. Looking as if the reels are placed inside a cyborg, everything is dark and ominous. As the reels spin some symbols come to life with video clips from the movie, adding to the interest gained from playing this slot. Your usual card symbols make up the lower values and you have John Connor, Sarah Connor, the T100, the T800 and of course good old Arnie to make up the higher values. 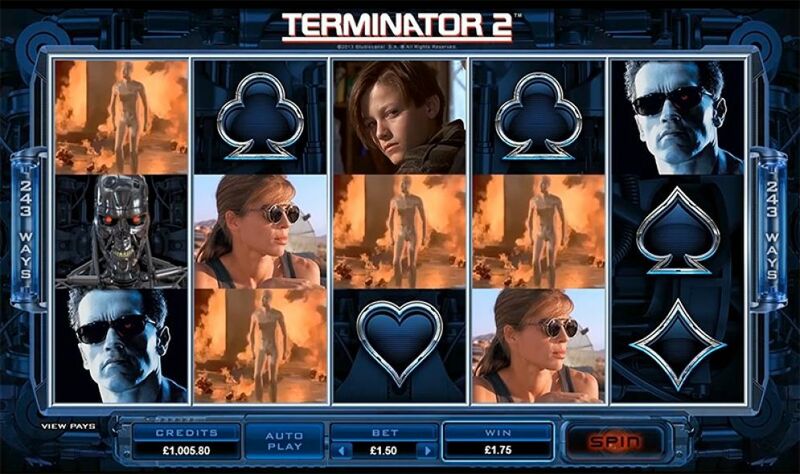 Bet Amounts – Betting on Terminator 2 begins at 30p per spin and can be increased to the maximum of £30 per spin, making Terminator 2 one of the more pocket friendly games about. Amend those bets by changing you coin size and coin amount until you reach your desired bet. Wild Symbol – A T2 logo with flames behind is your wild symbol and it will substitute for all other symbols except the scatter. It is your second highest paying symbol within the game offering up to a huge 1500x coins as a win, if you land 5 in a winning combination. Pay out will vary depending upon the stake amount at the time of the spin, so be sure to check the pay tables. Scatter Symbol – The scatter symbol is a blue portal filled with electricity and landing three of these anywhere in view will trigger the bonus round. This symbol is also your highest paying in Terminator 2 and landing 5 of these will offer up to a 3000x coin win, depending upon the stake at the time of the spin. T-800 Vision Feature – Randomly activated during the base game this feature is an interesting addition. As the feature begins the screen will go hazy and red, then you will see a target moving across the reels at random. Whenever the target lands on a high value symbol such as John or Sarah Connor it will award a cash value. If there is a minimum of one scatter on the reels when the feature lands, you can be awarded 10 bonus spins too! Bonus Spins Feature – Three or more of the portal scatter symbols will have triggered the bonus spins round. You will be allocated with 10 bonus spins to be played, as well as having an extra set of reels added to the game. This now increases your ways to win from 243 to 1024. Not only that the T-1000 symbol can now change into other characters when he lands. He will transform into whichever symbol is needed to create the highest possible win on the reels at the time. Progress Table Feature – Whilst this isn’t really something many people will be fond off, as it doesn’t actually bring any monetary value with it. We had to mention the progress table, for those frequent players who like to track how they are doing. Terminator 2 has a progress table, meaning every time you land a winning combination it is logged as an achievement. As a regular player you can check back on your previous progress and see what combinations you may be missing to complete a set. As we say there is no actually prize or monetary value attached to this feature, but if like us you like the sense of achievement then you will probably enjoy this feature as much as we did. Terminator 2, we will be back! Thoroughly enjoyable, from the mini clips, the sound effects and the interesting features too. We loved the fact that the T-1000 was morphing into symbols in the game much as he does in the movie. Bigger wins took a while to start seeping through whereas the smaller wins where more frequent, so bear this in mind when deciding to play. That bonus spins round seemed to take a while to trigger as well, however we did land the T-800 Vision feature more often and we did manage to trigger the bonus spins from there instead. Overall an intense game, designed with fans of the Terminator movies in mind, but we are sure non fans will enjoy it just as much.